What is 3rd Generation Service Desk ? When users need support, they have to have help available whenever and wherever they need it, otherwise their work cannot continue. Nowadays service providers are struggling to deliver services that are working efficiently, ensuring IT drives up productivity not costs and keeps the customer happy. 3rd Generation Service Desk meets customer’s expectations and gives access to expert level support at any time of day, wherever they are. We deliver 24/7 multilingual support and expertise across the Globe. We help transform IT from a cost center to a productivity driver by focusing support on achieving business outcomes. Through our unique sense and respond methodology we empower our experts to develop preventative solutions, which measures to continuously refine and optimize service and enable users to self-service wherever possible, to deliver an adaptive service that’s always aligned with business goals. To stay relevant in the future, the Service Desk proposition needs to change. This means: we need to rethink our approach and evolve the traditional Service Desk to deliver a complete service bundle, which can be accessed from any device around the Globe. With the 3rd Generation Service Desk we are striving to achieve the best user experience by bringing innovative ways on helping our customers. 3rd Generation Service desk provides customer with user-friendly portal which enables access to the information that the customer needs. Our self-service options will also allow you to receive immediate help without involving Service Desk. The portal has been designed with input from experts across the business and is delivered by AGS, enabling user’s strategy – putting you at the heart of everything we do. We work with our customers to decrease the amount of tickets they have and with our flexible pricing model to also bring down the cost of end-user support. How long does it take to transition Service Desk? As a rule of thumb we send a task force onsite to the current provider, to work side by side with them, creating documentation and learning how to support the customer. Then they return with members of the existing providers for 2 more weeks to finish the handover. All in all, it takes 4 weeks to properly transition the Service Desk. What Service Management system will be used? We use our own system within Atea but we are also able to integrate customer’s ITSM systems with ours. Yes, Self Service is included in the 3rd generation Service Desk. What hours do you provide Service Desk? The Atea Global Service desk is available 24/7/365. How do you decrease the number of tickets? We decrease the number of tickets by working together with our customers through a concept we like to call the Atea Smart Service Center. 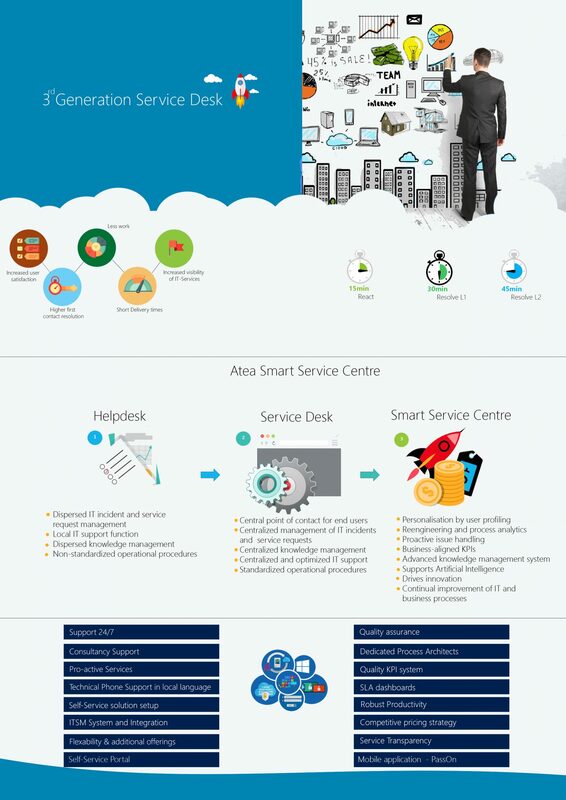 The Atea Smart Service Center enables end-user profiling, analytics and automation, which together with continuous service improvements, help achieve a reduced number of tickets and absorption of “hidden tickets” thus bringing down the cost of end-user support.